After an apprenticeship as tool maker at Hella KG, Ulrich Ahle studied Mechanical Engineering at the University of Paderborn. 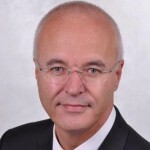 Firstly he was a development engineer in the field Printer Development at Nixdorf Computer AG, later team leader Technical Processes and responsible project manager for the implementation of the PLM system Metaphase (today Teamcenter) together with SAP. From 1996 on he was responsible at Siemens Business Services for the PLM business. After that he became General Manager for the e-Business Practice Business Information Management in the areas Knowledge Management, Product Lifecycle Management and Business Intelligence. Since 2011 Mr. Ahle is head of the Manufacturing, Retail & Transportation business at Atos in Germany. In addition Mr. Ahle is Member of the Board of the ProSTEP iViP organization in Germany which has its main activities in Engineering and Manufacturing IT. Here he represents the member group of IT product and service providers.